Your decision to get dental implants to replace missing teeth is significant. There are several health benefits that come along with replacement of missing teeth. Discussing with the dentist about the suitable options of dental implants is important. Once the procedure is done, there are several points to remember for a speedy and successful recovery. Make sure to follow the tips mentioned below to make dental implant recovery easy for you. It is common to witness swelling and bruising after the procedure. Applying cold compress on the cheek can help to reduce swelling and discomfort. Apply cold compress for about 20 to 30 minutes, followed by 10 minutes with ice pack off, and then back again with the cold compress. Do this as much as you can for the first 24 to 36 hours after surgery. To avoid skin irritation, make sure to apply a cold compress with a paper towel or cloth placed between your skin area and the ice pack. One of the most significant and unavoidable tips to follow after dental implant surgery is resting. Minimise strenuous activity including exercising as they can cause increased blood flow, leading to mild discomfort and swelling in the surgical site. Moreover, due to reduction of regular nourishments at this time, it is more likely to feel tired or dizzy during such activities. It is therefore suggested to keep away from such energy demanding activities for a few days until the recovery is complete. Yes. Smoking or chewing tobacco or use of tobacco products in any form can delay the process of healing. Use of tobacco can also increase the risks of postoperative problems. This is why it is best to quit tobacco usage, even if that’s difficult for you. There are specialists who can help you attain this goal. Your oral surgeon will prescribe adequate medications that are important for fast recovery. Don’t miss out to follow the doctor’s prescriptions and have them as suggested for an easy and speedy recovery. Not to forget taking antibiotics prescriptions to prevent infections. Additionally, doctors will also prescribe pain medications such as Ibuprofen, Tylenol, Acetaminophen and more. These medications should be taken only as directed by the surgeon. Banana Mango Shake: Banana mango shake is one of the healthy drinks that can help restore the electrolytes and regulate the fluid balance in your body. Tomato Soup: Get the goodness of tomato with the great, tasting tomato soup. Applesauce: While you cannot chew apples, applesauce is the best way to have them. Chicken salad: After chopping it into small pieces, chicken shall be eaten with a healthy salad. Whilst chicken gives us the protein for healing, vegetable salad comes packed with essential nutrients and vitamins. Broccoli Omelette: Broccoli omelette is a very healthy and tasty way of making your recovery process easier. Broccoli has calcium, sufficient enough to speed up the healing process, whilst egg contains enough protein that makes way for a balance diet. Apart from the above tips, it is highly important that you make appointments with your surgeon as per schedule. Your surgeon can analyse the progress of recovery and ensure that it is made as easy and smooth as possible, alongside giving you recommendations for the same. Follow these essential recovery tips mentioned above to survive through the recovery phase easier. Give adequate rest for your body to heal and for the dental implants to complete fuse into the jawbone. You can be sure of owing a great smile and experiencing comfort for many years. What is the recovery period for dental implant? The recovery period for dental implants depends on the type of implant, grafting, the size of the graft and your own particular healing. 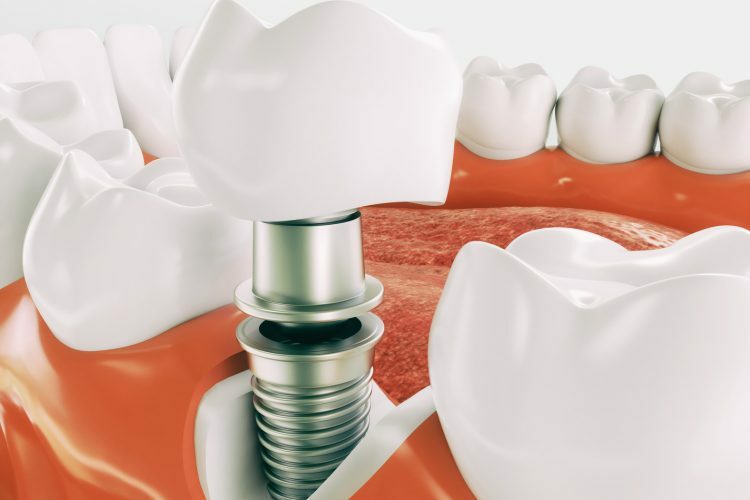 If you are a person who experience quick healing from cuts and are overall in good health you could expect quick healing after dental implants. Younger people with good nutrition and who take an antibiotic prior to treatment, would more likely to have a quicker healing than would an older person who is a diabetic and smokes and has poor circulation. It could be a day or it could take two weeks, on average its couple of days. Adjusting your diet during the dental implant recovery period is one of the most important things you can do to help your mouth heal faster. Day of Surgery: During the first 24 hours, confine your food intake to liquids, such as smoothies and milkshakes, but don’t use straws, since sucking can dislodge blood clots and cause more bleeding. Also, avoid carbonated beverages and very hot foods or drinks. Few days after surgery: You can transition to pureed foods after the first day of recovery, but it’s still important to avoid using straws and consuming extremely hot foods. You can have Pudding, Yogurt, Ice cream, Applesauce, etc. Up to Two weeks after surgery: As you start to feel better you can move onto soft chewable food, but take note: not all “soft” foods are advisable. You’ll want to avoid anything that can get lodged in the surgical areas. You can have Scrambled eggs, Soups, Pasta, Soft bread, etc. Improved appearance: Dental implants look and feel more natural. Since they fuse with your jawbone, they become permanent. Eventually, you won’t even notice them. Improved comfort: Once you’re used to the feel of your new dental implants, they are naturally a part of you! Easier eating: No more having to worry about not being able to eat your favorite foods! Since dental implants are fused into your jaw, they work just like regular teeth. Won’t affect Working teeth: Dental implants do not affect working teeth, improving your overall oral health. Plus, it’s easier to brush between individual implanted teeth. Last Longer: With good care, these durable implants can last a lifetime. Who should get dental implants treatment? If you have a jawbone that has reached full growth, then you can opt for dental implants treatment. Does any Body Reject Dental Implant? Due to rare allergies to the titanium alloy that makes up the implant. The majority of dental implants are made with titanium because it has proven to be the most biologically compatible of all metals. On average, less than one percent of potential dental implant recipients reported an allergy to titanium. Another reason for dental implant failure comes from the patient’s care after surgery. Without great oral hygiene, regular teeth fail and eventually fall out. A dental implant is no different. Taking care of your teeth, even the implants, prevents gum decay and structure failure in the long run.